The 63,000-square-foot Cultural Heritage Center is the headquarters for the State Historical Society. This $6.5 million facility, completed in 1989, houses four of the Society's five program areas: archives, historic preservation, museum, and research and publishing. The state's archaeology program is located in Rapid City. The 63,000-square-foot Cultural Heritage Center is the home of the South Dakota State Historical Society and a unique point of interest for South Dakota tourism. This $6.5 million facility, completed in 1989, houses four of the Society's five program areas: archives, historic preservation, museum, and research and publishing. The state's archaeology program is located in Rapid City. The SDSHS, first organized as the Old Settlers Association of Dakota Territory in 1862, established its official relationship with state government in 1901 through the former Department of History. Originally housed in the state capitol, the Society moved in 1932 to the newly completed Soldiers' and Sailors' Memorial Building across the street. 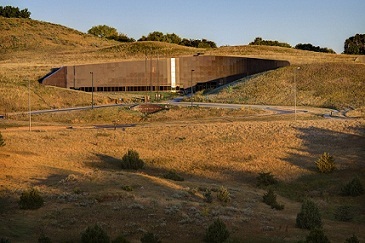 In 1989, South Dakota celebrated its centennial and to mark the anniversary and showcase the state's local history, the Cultural Heritage Center was built as the new headquarters for the Society. Today it’s a local attraction and a unique place to explore. Through the years, state government organizations have shaped and reshaped the Society into the vigorous organization it is today. Visit the South Dakota State Historical Society. The South Dakota State Archaeological Research Center explores, preserves, and exhibits the archaeological record of South Dakota's human story for present and future generations. The State Archives of the South Dakota State Historical Society collects, appraises, accessions, describes, organizes, preserves, determines significance of, and makes available archival materials which have permanent historical and research value. These materials include manuscript collections, South Dakota state, county, and town government records, photographs, maps, sound and video recordings, and more. The State Historic Preservation Office (SHPO) manages the National Register of Historic Places program of the National Park Service in South Dakota. The Museum of the South Dakota State Historical Society promotes understanding and appreciation of South Dakota’s rich heritage and local history through collections, exhibits, programs and events that engage and inspire people to explore history’s impact. The South Dakota State Historical Society Press preserves, researches, and promotes the evidence of South Dakota's colorful culture and heritage.